Gemini Software System Reviews - Legit or Scam? Brandon Lewis is a former Google engineer and now the founder and CEO of a company named Gemini Holdings. There is not much known about him, except for the presumption that he has vast experience in the software development field as well as in algorithmic trading. He has developed a software that he says allowed him to stop working and retire at the age of 28. He has a vision of releasing his software to a limited number of people who wish to make some money on the market, without taking on any additional risk of investment. There is not a single negative income and the software promises daily profit of several thousands of dollars. According to the promotional video on the company’s official website, the Gemini Software System compounds your results and re-invests your money. This is done in order to increase your return on investment and the total profit as well along the way. However, the fact is that there is very little known about this software and the way it functions. In fact, the results it generates cannot be verified and the only available information are in the promotional video, narrated by Brandon Lewis himself. The software is said to take your available deposit and, after you have marked the “autopilot” option and trade on the foreign exchange market, it will win you profit every time. In fact, the advertisement on the official Gemini Software System’s website states that you will earn at least $97,253 a month, which makes around $3,242 a day. However, if you wish to know how this software really works, here are our thoughts on the subject. We believe that the software featured in the ad video is fake. Actually, when you deposit your funds, soon after you will see that there is no trading software and the product you will be offered has nothing to do with it. If you do go on and register for the Gemini Software System, you will be sent to another page, where you will be offered with completely different products that cost between $250 and $10,000. You will be buying banner ads, which will certainly not make you any money in the future. The software is claimed to be completely free. However, this is not the truth. The Gemini Software System requires you to deposit at least $250 in order to start trading on the platform. There are no genuine corporate documentation that can prove beyond any doubt that this is a legit company. In addition to that, as there is not much known about the owner and CEO of the company, Brandon Lewis, there is reasonable doubt that the person featured in the video is real. After some more online researching, we have come to the conclusion that this is actually a paid actor and that Brandon Lewis, a former Google engineer, doesn’t actually exist. Not only that, we stumbled upon a completely different Gemini company when we searched the internet to find any useful information about the company that stands behind this software. This other company that we found has nothing to do with the Gemini Holdings. The system is anonymous and you will certainly not manage to get in touch with Brandon Lewis himself. Furthermore, the system has no license and is not able to provide you with the binary option signals needed to really get the trade going on an actual market. If you do some research yourself, you will see that no credible broker is connected to this platform, which is another indication that the whole system is a fraud and you should stay away from it. There is also no legit proof that this software is registered, not only in the United States, but anywhere else in the world either. If you wish to have access to a genuine trading software, you should definitely look into some other options. First one is Penny Millionaire, a binary trading options software that promises results in about two months after you start using it. In fact, if you have a little bit of spare time on your hands, you might want to join up, as this software is not only easy to use, but it will deliver as well. All you have to do is wait, be patient and trade. 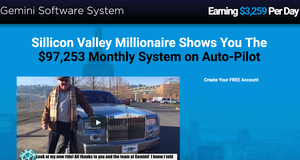 Lazy Millionaire is another software from this category that is not conclusively legit, as there is not much information available online about its founders and the way it works. Therefore, we recommend that you use it with caution. Through our investigation, we have stumbled upon yet another possible scam that goes by the name Desert Millionaire, so be careful about that as well. As we have already mentioned, we don’t recommend that you get involved with the Gemini Software System, as all the information available shows that this is a scam. However, if you wish to see it for yourself, visit their website. If you are looking to earn some fast money through the binary option trading software, do extensive research first. Many of the systems that promise high yields in a short amount of time are most commonly a scam, designed to take your money fast and easy. One of those products is the Gemini Software System, which promises to bring you thousands of dollars of profit a month. However, it sells you advertisements you don’t really need and cannot be used to make some money either. Average Rating for " Gemini Software System " is 5 out of 5 based on 1 reviews. This is a scam that uses the same principle of the red and black bets of the "Martingala" method of "winningg" the Roulette. It does not work at all. At the end you will loose everything in a blink of an eye.